The sacraments of Christian initiation—Baptism, Confirmation, and Eucharist—lay the foundations of every Christian life. (CCC 1212) In Baptism, the individual becomes an adopted child of God and is joined into the one body of Christ, the Church. In addition to receiving the grace to participate in the divine nature, the individual is included in the community of salvation and worship in the visible Church. 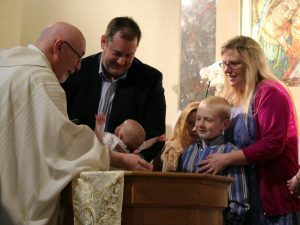 Parents who wish to have their child baptized should arrange for the baptism of their child at least four months in advance to allow for the required preparation for this sacrament. Parents presenting a child for baptism are expected to attend a preparation class for parents and godparents. When selecting godparents for your child, please remember that the godparents represent the faith of the parish community into which the child is being baptized. Thus, the godparent should be a strong role model and witness to the life of a Catholic Christian committed in faith to stand with the parents of the child. Furthermore, canon law requires that a candidate for Baptism, membership in the Church community, should be sponsored by a baptized and confirmed member of the Catholic Church who is willing and able to help the child develop and grow in the Catholic Faith. There must be at least one sponsor or godparent. In the case where there are two sponsors, one must be male and the other female. The maximum number of sponsors is two. The minimum age for a baptized and confirmed Catholic to be a sponsor is sixteen (16) years of age. A baptized Christian may be a witness while a sponsor/godparent must be a baptized and confirmed Catholic. Non-baptized persons may not officially act as a sponsor or a witness to a Baptism of a child in the Catholic Faith. Parents must attend one Session A followed by a Session B. Upon completion of both workshop sessions, parents will be able to schedule their child’s baptism. Baptisms are held during any Sunday Mass including the 4pm Vigil Mass on Saturday afternoon, except during the season of Lent. Please note that to complete a request, a copy of your child’s birth certificate will be required which may be uploaded during the registration process or emailed to info@staugustineparish.org or mailed to: St. Augustine Parish, 35 Essex St., Andover, MA 01810. You will receive an email or phone confirmation of your request upon approval and receipt of all paperwork. Please contact Dan and Jacqueline Fague with any questions/concerns at (978) 623-0944 or via e-mail at djf8gue@verizon.net. Dan and Jacqueline invite any and all interested persons to help them in this rewarding ministry. Contact them for more information.